RIO DE JANEIRO, BRAZIL – The five main beaches of Rio de Janeiro that line Zona Sul (South Zone) are primarily defined by neighborhoods, in order from east to west, Leme, Copacabana, Arpoador, Ipanema and Leblon. By far the largest is Copacabana, and Ipanema is the more famous and desirable in contemporary times, but there are more distinctions for visitors and tourists to learn. Posto 5 in Copacabana is on the far west of Rio’s longest beach neighborhood, photo by Alexandre Macieira/Riotur. In addition to the neighborhood names, stretching across over 8km of coastline, the beaches are divided by twelve ‘postos’ (posts). Numbered lifeguard towers spaced just under a kilometer apart offering toilets, changing rooms and showers for around R$2.00, although often less for locals. Not only do the postos provide a practical resource and a useful landmark when navigating the beachfront, each posto and area on the corresponding beach also comes with a different ambiance with an option to suit every type of beachgoer. “The difference in atmosphere between the postos stem from the type of people who visit,” says Carioca Simone Rodrigues, a local resident born in Rio. 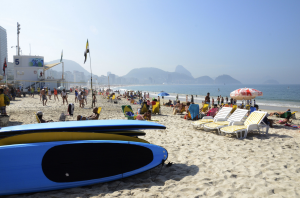 The Leme beach can be found at Posto 1 and shares the same stretch of sand as the iconic Copacabana beach. Extending for 1km from the ‘Morro do Leme’, a large mountain lined with a fisherman’s walk, it is slightly less populated then further along in Copacabana. Its relaxed atmosphere is popular with older residents, families and surfers. Postos 2 to 6 in Copacabana do not have a defined crowd, but standing adjacent to the 4km stretch of beach are some of the cities largest and most glamorous hotels, like the Copacabana Palace, attracting tourists and business travelers. Lining the beachfront in-between the all postos are a variety of kiosks serving an assortment of food and drink. The kiosks in Copacabana provide a greater selection than most and some also provide live music. Around the headland and just before Ipanema lies Posto 7 and Arpoador, a small area of beach defined by Pedra do Arpoador (Arpoador rock). This area is popular for surfers, with a floodlight to enable surfing at dawn and dusk. This spot is also the perfect location to watch the sunset over the Dois Irmãos (Two Brothers) peaks with crowds gathering together at the end of every day to cheer and take in the cinematic backdrop. Ipanema beach, with Postos 8 and 9 being the nearest stretch of beach to General Osório metro station in Ipanema, draws the most beach-goers on their way in from the outer neighborhoods, creating a more eclectic crowd of locals and tourists with a lively atmosphere. Posto 7 in Arpoador is popular for surfers and watching the sun set, photo by Alexandre Macieira/Riotur. “My favorite beach is Ipanema. You can see the most beautiful sun sets in the world. Beautiful people, open minded and from all over the world. My favorite barraca is number 62, called barraca da Denise. They are very friendly and they do a great caipirinha” says Rio resident and Portuguese teacher Allan Pedro. Although all of Rio’s beaches are gay and lesbian friendly, rainbow flags flying high over the beach barracas (vendor tents) between Postos 8 and 9 mark the area for the LGBT crowd. The young and beautiful, armed with bikes, skateboards and enviable physiques gather around Postos 9 and 10; the most popular section of the beach drawing large crowds to the buzzing atmosphere. It was also the setting for the songwriters Tom Jobim and Vinicius de Moraes famous bossa nova song ‘The Girl from Ipanema’. Crossing over the Canal do Jardim de Alah, Rio’s most affluent neighborhood Leblon can be found. Between Postos 11 and 12, the crowds disperse and the beach has a more exclusive feel; popular with Leblon residents, young families and the rich and famous. The waters are often not as clean in Leblon because it is also bordered on the far end by the canal that follows Rua Visconde de Albuquerque, but the quieter crowds and more laid-back atmosphere is a noticeable difference. “As Leblon beach currently has no metro [subway train], it means there are more locals and richer people. Even the prices there are higher. Brazilian celebrities love those postos.” continues Pedro. I’ve been to each one of these beaches and my best experience was Leblon, followed by Ipanema though I enjoyed them all. They remind me of the SoCal beaches in that each one, from Venice to Hermosa to Malibu, all have a different feel. Try them all. You’ll find something you love.